If you’re either a Seller on Amazon, a Manufacturer whose products are being sold on Amazon by 3rd party sellers, a Data Scientist or a Researcher who needs to work with product review data in your company’s internal systems, then you’re at the right place. With our tools and services, you can get your product reviews in CSV format in two simple ways, whichever suits you best. If you need to download this data now and then, or even only one time, for punctual data analysis, then our Amazon Review Exporter is the right and fastest service for you! *or you simply want to read all your reviews and analyze them manually. 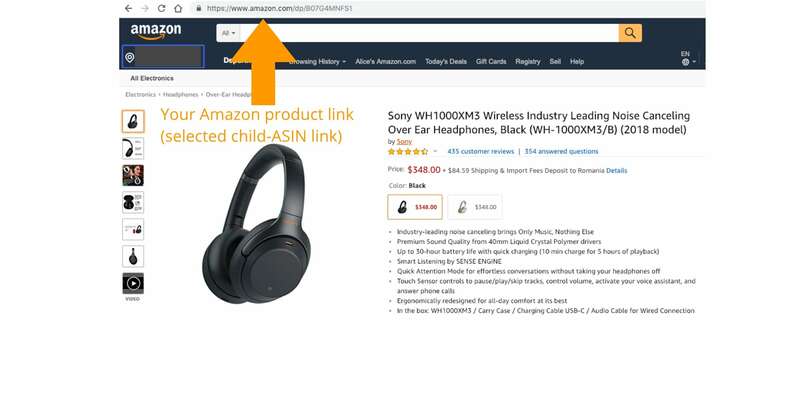 By ‘product link’, we mean one of the child-ASIN links, as above highlighted: https://www.amazon.com/dp/B07G4MNFS1. Do not worry! Amazon Review Exporter will deliver the reviews aggregated for all child-ASINs of a parent product, regardless of how few or many variants it has (e.g. sizes, colors etc.). At this point, you can follow with the last step and purchase the CSV review file. 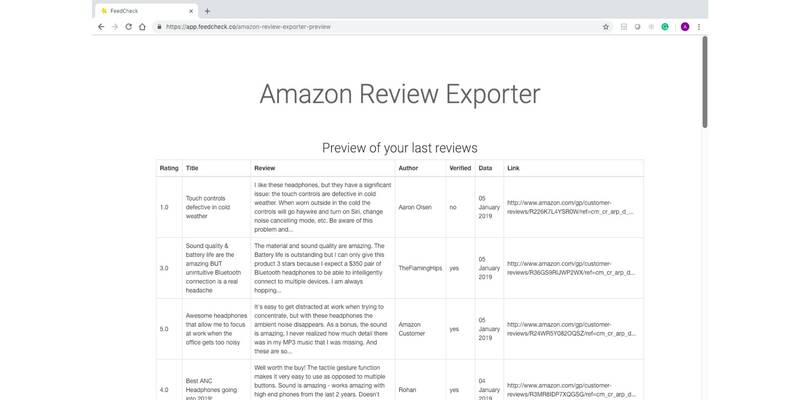 After the ‘Buy now’ and entering your payment details, please be patient while the Amazon Review Exporter is collecting all your product reviews and putting them into the CSV file that you’ll download once it’s ready. This operation might take a few minutes depending on the number of reviews that need to be aggregated and the number of child-ASINs behind. In case you conduct research projects for which you need reviews of a significant number of products, please get in touch for a personalized offer. The range of data exported is a little bit richer than the one provided by the Amazon Review Exporter and it can also be filtered according to your needs before downloading it to CSV/Excel. Thus, your Excel file can contain reviews of specific star ratings, selected products of yours or your competitors, from selected marketplaces and so on. Does the CSV/Excel export work only for the Amazon marketplaces? 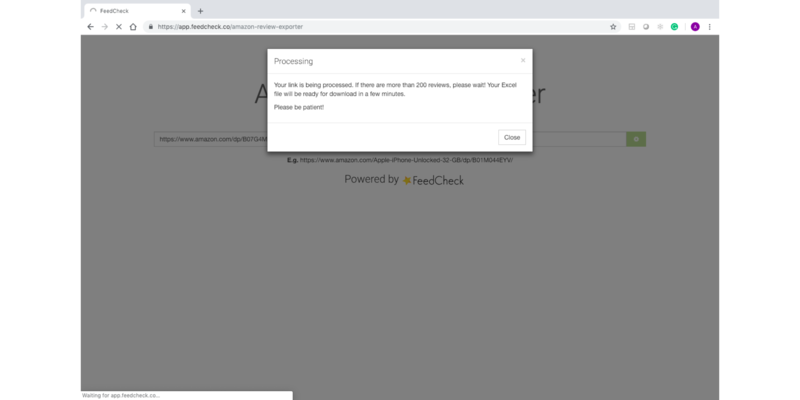 While, as the name says, the Amazon Review Exporter works exclusively for the Amazon marketplaces, FeedCheck review monitoring platform can support any eCommerce platform in the world. That means that you can download your product reviews to Excel from any marketplace or online store that you can think of. Here is a list of supported web-stores which keeps growing. Whichever your situation is, following the above steps you can easily download your product reviews either occasionally, when your projects require it, or you can benefit of a constant monthly service that allows you the flexibility of downloading exactly the product reviews that you need.